A Blick exclusive, this sturdy mobile storage cart looks great and provides a variety of storage options for classrooms and studios. Featuring hard maple face frames and panels with a clear finish, the Hann Mobile Art Storage Cart includes two 2¾"H × 30"W × 19"D lockable storage drawers that feature dovetail construction and smooth-operating, epoxy-coated steel runners that are rated to support 100 lb of art supplies. The roomy storage area beneath the drawers features an adjustable shelf. Also included are two tote trays and two tote caddies that are ideal for storage as well as for quick project setup and cleanup. The unit is available with or without lockable doors. The 36"W × 24"D Fiberesin top features a hard maple lip around the perimeter to keep supplies in place while the cart is being moved. The casters are made of thermoplastic rubber, mounted on a polyolefin hub. All four casters can be locked, making it easy to move the cart around the classroom or studio, between classrooms, or entirely out of the way! 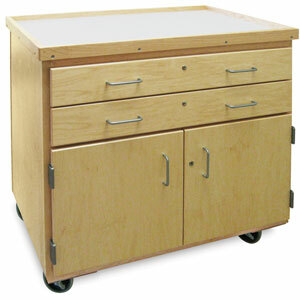 The Hann Mobile Art Storage Cart weighs 165 lb (without doors) or 175 lb (with doors).